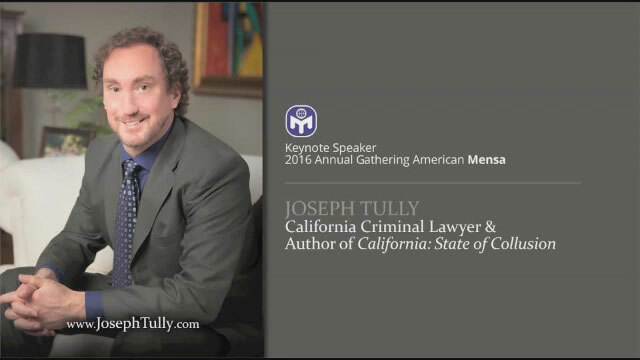 Criminal law specialist Joseph Tully, a noted criminal lawyer in CA, addressed the 2016 Mensa Annual Gathering in San Diego on the topic of his new book California: State of Collusion. Welcomed by an SRO (Standing Room Only) crowd, Joseph Tully shared the startling realities of California's failed criminal justice system: psychopathic police, overzealous and scheming prosecutors, while judges do nothing. True stories that we wish were fiction.